Boesch Motorboats, founded in 1920 by Jakob Bösch, built many sailboats before and during World War II. 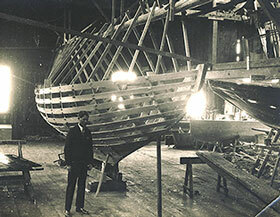 In 1928 his son Walter presented his apprentice masterpiece; he is the grandfather of Markus, who runs the company today. In the 1960s, the German electrical equipment manufacturer Bosch opposed the boatbuilder’s use of its trademark name; thanks to the subtlety of German, “oe” replaced “ö” without changing the pronunciation. Located in Kilchberg, a quiet village a few kilometers from the center of Zürich, Switzerland, Boesch Motorboats is the last in the world to produce serial mahogany runabouts. On the road that closely runs along Lake Zürich, at the water’s edge stand a few wooden buildings from a bygone age. The white Boesch signature across one facade contrasts with the bright red of the building’s wood siding. In the 1970s Klaus Boesch, an engineer and naval architect, succeeded Walter Boesch, who had succeeded Jakob, who founded the company in 1920. Now, Klaus’s son Markus is the fourth generation to head the business. Even in this country, where stability is a national treasure, it is rare to find examples of such continuity. Each generation has contributed to technical progress and innovation, assuring that every Boesch is a boat of its time. The company’s various activities form a small, independent group spread over several sites. The well-preserved original buildings—once owned by Treichler & Co. boatyard—house the administrative center, the engineering and design offices, the restoration and mechanical workshops, a showroom, a marina, and boat storage. In 1973 the series production was installed in large, modern workshops in Sihlbrugg, less than an hour’s drive toward the mountains. Production has remained stable over recent years. Of the 25 to 35 units built a year, half are sold to the domestic Swiss market and the other half for export to predominantly German-speaking markets. 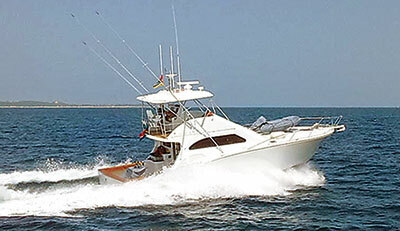 Since the 1970s, Boesch has created a network of dealers and boat services associated with the parent company. One is on the other side of Lake Zürich, where the concentration of Boesch boats is impressive (480, of which 250 are stored by the builder for the winter season), as well as in Rolle on Lake Geneva, on Lake Lucerne, and farther south on the Swiss part of Lake Maggiore at Tenero in the Ticino canton. Abroad, there is a distributor for each of the European countries and representatives in other major countries of the world. In the ’80s Urs Boesch, a mechanical engineer, designed the unusual “bulge” rudders after studying water flow along the hull bottom through a Plexiglas panel installed for viewing. Urs’s brother Klaus Boesch, an engineer and naval architect, continues to design all the models by hand with splines and “whale” weights. This large metal and wood structure pivots on a central axis to aid hull construction. 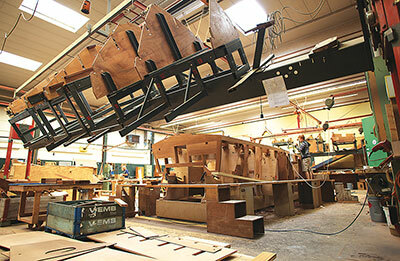 The yard builds about 30 boats a year. A 710 (7.5m/24.6′) model requires roughly 1,000 man-hours, and a 970 (10m/32.8′), twice that. The laminated hulls of Boesch boats are cut from mahogany plywood manufactured specifically to the company’s standards (up to 11 layers) by its supplier of more than 50 years. Klaus’s brother Urs Boesch, who is responsible for all mechanical systems, adapted a diesel engine for this special 10-passenger 970 model for an Austrian hotel. Custom orders are not unusual. Henri Thibault (ALL) Markus Boesch test-drives a 750 (7.8m/25.6′) Portofino Deluxe powered by a V8 gas engine; an electric-power version of the model is also available. Several hotels and resorts maintain fleets of Boesch boats for waterskiing and excursions. Some establishments employ their Boeschs for promotion, offering champagne cruises. These hotels sometimes order special models, such as the 10-seater 970 powered by a Yanmar diesel, an exception in an exclusively V8 gasoline-fueled range. The latter includes four models with various finishes and equipment, namely the 620 (6.5m/21.3′), the 710 (7.5m/24.6′), the 750 (7.8m/25.6′), and the 970 (10m/32.8′). In recent years, the shipyard has expanded its model lines with three electric-powered versions of the 620, 710, and 750. One of its loyal customers owns three boats, two of which are electric. Klaus Boesch says, “Not so long ago it was unthinkable for most of our customers not to have a big V8 engine. Now, they are more and more interested in zero emissions propulsion and its silence.” In fact, one third of sales are now the electric versions that cost almost double the V8 models. But the gas engines are also notable for their quietness, appreciated especially on the Swiss waters. As Klaus’s brother Urs says, “A Boesch V8 doesn’t bark or growl. It is characterized by a rather reassuring murmur.” This is the result of a “cascade” system of exhaust silencers, an invention by which standard mufflers are extended with a second that optimizes the flow of exhaust gases with the cooling water and propels the mixture into a soundproof chamber located on the transom. There the gases are mixed with water sprayed by a special blade below the waterline. As the boat goes faster, the water spray increases to reduce the noise. Also contributing to quietness is the “bulge” rudder. 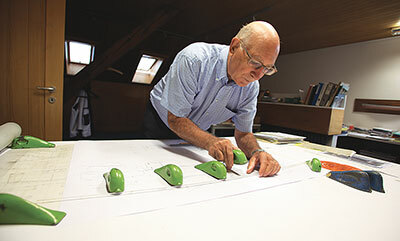 Urs, a mechanical engineer, developed the rudder profile during routine testing in a boat with a Plexiglas panel allowing him to observe the turbulence generated by the propeller. 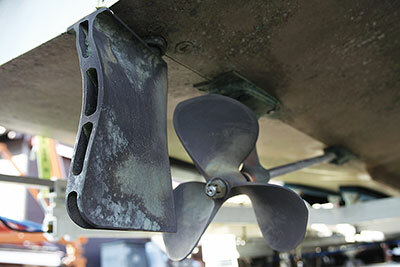 The rudder’s special shape enables the boat to run straight ahead with minimal steering. Seestrasse 197, Postfach 529, 8802 Kilchberg/Zürich, Switzerland, tel. +41 44 711 75 75, fax +41 44 711 75 76, website www.boesch-boats.ch. 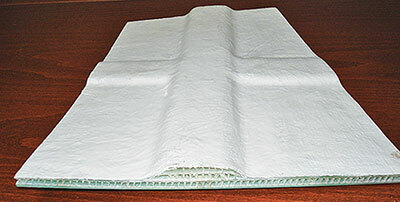 Parabeam drapable fabric is made of E-glass and engineered with warp, weft, and pile fibers that maintain some airspace between the two skins. In tooling built from the material, that space can be filled with warm water to post-cure the laminates. We’ve written a number of times about Parabeam, the 3D drapable fabric made up of two skins of E-glass connected with vertical strands that resist compression. When wetted out on both sides, the skins collapse but only temporarily, as they spring back to the original profile, between 3mm and 12mm (0.12″ and 0.47″) thick. Thicker versions are available by special order. That has changed. At Princess Yachts (Plymouth, United Kingdom), Julian Spooner confirms they are employing Parabeam in making heat-controlled tooling, and Larson Boats (Little Falls, Minnesota) evaluated Parabeam in its VEC tooling program. In 2006, Larson and Glastron brands of small powerboats were part of Irwin Jacobs’s Genmar marine conglomerate. Jacobs also had bought Greenville, Pennsylvania–based VEC Technology, a proprietary manufacturing process employing lightweight composite mold skins supported by water in a heavy steel chamber. As I wrote in “VEC” (PBB No. 101): “A VEC ‘cell’ can be operated by one person, from laying in reinforcements to initiating the resin injection to removing the part.” It has brought considerable innovation and efficiencies to production boatbuilding, the likes of which have not been seen elsewhere in the industry. Parabeam was experi­mented with in place of conventional reinforcements, first with an 18mm (3⁄4″) product, then a 12mm (1⁄2″) product, and then with multiple layers of 5mm (3⁄16″). Following my visit to Little Falls, Larson apparently experienced some deterioration in its Parabeam-made vinylester resin molds. Consultants suggested epoxy but the resin change was not implemented, and application in the water environment was discontinued. However, out of this application evaluation came recognition of the benefits of tooling made with Parabeam, and Larson adopted an ongoing application for its open-mold tooling and has been employing Parabeam in its mold manufacturing for the last six years. Advantages are said to be faster mold build time; better impact resistance and less repair time; weight savings up to 30% over conventional tools; temperature control option; and less time to bring the mold up to working temperature after it has been stored outside in the cold. Lamination one is 0.05″ (1.26mm) chop or mat with neat resin. Lamination two is 0.05″ chop or mat with mold-making (filled) resin (Cook, Nord, or RCI filled mold-making resins). Lamination three is 0.06″ (1.5mm) chop or mat with neat resin. Lamination four is ParaGlass/ 5 with neat resin. Lamination five is ParaGlass/ 5 with neat resin applied at right angle to first PG 5 lamination. Option of third and fourth ParaGlass/ 5 lamination. Lamination six is 0.02″ (0.5mm) chop or mat with neat resin. A framework may be applied after full cure to provide further structure and aid. To take advantage of Parabeam’s unique spatial qualities, over time several other companies have incorporated it in their manufacturing: Kenway (Augusta, Maine) for the hollow jacket in TCM (temperature controlled molds) processing; and Parabeam’s parent company, ZCL Composites (Edmonton, Alberta, Canada), in its proprietary underground storage tanks and tank liners in order to detect leaks before they get into the ground water. Parabeam has also been working in France with Stuart Ford, owner of Marine Technique Mediterranean, in the development of his patented Cameleon composite fence system, made of Parabeam panels, through which swimming pool water is circulated and heated by solar energy. In addition to the applications outlined above, Parabeam has been most active in supplying companies in aerospace/military (Boeing, Airbus, Metal Cladding, and Oshkosh-Fiberdome), rapid transit (Bombardier, CAF, and BFG), and architecture (Kunovar & Kamni, and Disney theme parks and movie sets) with advanced composite solutions through its customer networks in North America, Europe, and Asia. Parabeam, P.O. Box 134, 5700 AC Helmond, The Netherlands, tel. +31 492 591 222, fax +31 492 591 220, website www.parabeam3d.com. Du Toit Yacht Design of Durbanville, South Africa, recently celebrated the launching of a 75′ (23m) expedition power catamaran with a range of more than 3,400 nm at 8 knots. Provisions were made for the owner, an avid deepsea sport fisherman, to occasionally tow his 48′ (14.6m) sportfisherman, Big Bob. At the risk of stereotyping South African yacht design preferences, I must say the country certainly has estab­lished itself as a font of catamaran inventiveness, in sail and power. The dominance of Robertson & Caine (Capetown) comes to mind (see “After Apartheid,” PBB No. 83; and “A Couple of Impressive Cats,” No. 119). Anton du Toit—who grew up circumnavigating with his parents for 13 years; apprenticed with Angelo Lavranos & Associates (then in South Africa, now in Auckland, New Zealand), a distinguished design firm specializing in cruising catamarans; and worked at Southern Wind Shipyard (Cape Town)—continues the tradition. In business on his own since 2001, du Toit and his team have produced a varied and noteworthy portfolio that includes a whale-watching RIB, a steam launch, a day charter cat, a high-performance powerboat, a research vessel conversion to luxury yacht, a sportfish cat, trailer-sailers, and numerous sailing catamarans. Other current projects are a 75′ sailing catamaran, another 750E expedition cat to be built by Two Oceans Marine (Cape Town) and launched midyear, a Bongers 47 (14.3m) sailing cat, a 29′ (8.8m) racing catamaran for GW Marine (Durban, South Africa), and a Carkeek 60 for Premier Composite Technologies (Dubai, United Arab Emerites). Du Toit’s in-house team includes Sean Youldon, who is working on a Westlawn degree; interior designer Lucille Barry; and Charmaine du Toit, who helps with interior and detail design, and bookkeeping. Du Toit Yacht Design, P.O. Box 2524, Durbanville 7551, Cape Town, South Africa, tel. (021) 975 2580, fax (021) 975 4039, website www.dtyd.co.za. Perhaps hard to believe, but TruDesign’s glass-reinforced nylon seacocks have passed flame-resistance tests. 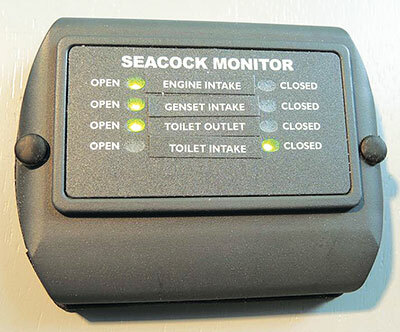 The company’s Seacock Monitor indicates whether a given valve is open or closed. When it comes to raw-water plumbing, there are essentially two reliable material choices, bronze and internally reinforced plastics. Bronze is tried and true, rugged, long-lived, abrasion and fire resistant. It has proved itself over many years and thousands of installations, from seacocks to raw-water strainers and distribution manifolds. It has, however, one fatal weakness: it is susceptible to stray-current corrosion and in some cases galvanic corrosion as well. It’s also incompatible with aluminum and to some extent steel, and as such is typically not used on vessels whose hulls are made from those alloys. 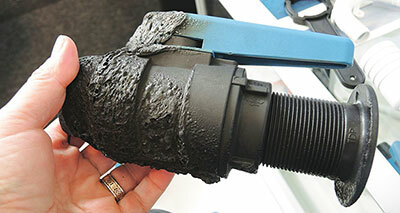 Nonmetallic plumbing components, while not failure-free, are very attractive in that they are completely immune to corrosion and are well suited to alloy vessels as well as to harsh applications such as sanitation systems. As I walked the aisles at the Marine Equipment Trade Show in Amsterdam last November, I encountered TruDesign, a New Zealand manufacturer founded in 1974 that offers a variety of glass-reinforced nylon raw-water plumbing components, including conventional valves, sanitation system Y-valves, Y-fittings, remotely actuated electronic valves, antisiphon loops, and valve position monitors, among other items. Valve seals are Teflon and require no maintenance other than periodic cycling. Components resist fuel and most other shipboard chemicals, and they meet BV, ISO, and IMCI standards (the valves have passed flame-resistance tests), and have been independently tested for compliance. TruDesign Plastics, 243 Ti Rakau Dr., East Tamaki, 2013 Auckland, New Zealand, tel. 0064 9 274–5792, fax 0064 9 274–6722, website www.trudesignplastics.com. The low-profile framing of this 28′ (8.5m) RIB incorporates Prisma preforms; the boat was infused at Brunswick Commercial Products in Edgewater, Florida. 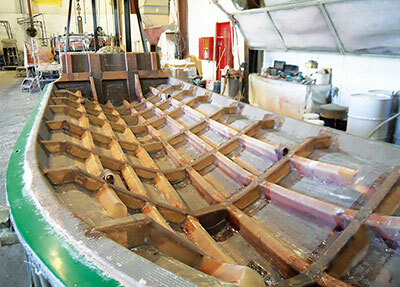 One result of the thin-skin low-section framing is a 40% reduction in hull and deck weight. Scott Lewit’s Structural Composites company in Melbourne, Florida, engineers supporting structures for boats. In fact, it set up a separate sister company called COMPSYS Inc. to market Prisma preformed grid systems. But that’s not all it does: SC offers design, engineering, and prototyping capabilities for military and commercial clients (the latter includes automotive and amusement parks as well as marine). R&D is a big part of what the company does, and over the past few years it has been involved in several interesting research projects for the U.S. Navy, includ­ing development of composites to reduce noise in under­water structures, and a study of fire performance in composite materials for naval applications. We’ll briefly describe a third here: the development of a new composite construction method for certain combatant craft, such as rigid hull inflatable boats (RHIBs). Zodiac Boats (Stephensville, Maryland) and SC collaborated on a solution, were funded, and completed Phase I in December 2009. Phase II, to design, test, and deliver two 7m (23′) RHIBs, was awarded in November 2010. Using COSMOS finite element analysis software, SC proposed abandoning conventional rigid hull skin and framing in favor of a shock-absorbing suspended cockpit design and hull structure that uses co-infused low-section preform framing and a single-skin composite laminate that reduces weight by more than 20%. In Phase III a 28′ (8.5m) RIB, built in collaboration with Brunswick Commercial Products, had a 40% reduction in hull and deck weight; and a 36’ (11m) RIB, built with Zodiac, had a 37% reduction in hull and deck weight by applying the same design concepts. In the advanced design a three-layer laminate membrane consists of 0°/90° carbon fiber to absorb most of the in-plane loads, sandwiched between two layers of Innegra HMPP that Vectorply Corp. converts to a ±45° fabric. The low-profile framing incorporates Prisma preforms from Lewit’s COMPSYS company. Because conventional gelcoat isn’t suitable for the more flexible membrane in the advanced design, a Sharkskin coating was employed. Sharkskin is an emerging technology under development at SC as a gelcoat-and-resin system; it utilizes elements of urethane chemistry to allow coatings and laminates to have much more elongation than conventional resin provides. These shock-mitigation efforts address the same issues discussed in recent articles in PBB: “Practical Impact-Exposure Testing” in No. 142, and “Analyzing Accelera­tions,” Parts 1 and 2 in Nos. 140 and 141. SC’s range of solutions incorporates other measures beyond the skin and frame. The company proposes decoupling the RHIB cockpit from the hull framing by suspending it, and is researching how air pressure inside the cockpit structure and under the floor can mitigate shock loads. The inspiration for this latter study? Lewit was collecting data aboard a test boat when it came off a wave and every drink holder popped like a cork from a champagne bottle. Structural Composites, 7705 Technology Dr., West Melbourne, FL 32904 USA, tel. 321–951–9464, fax 321–728–9071, website www.structuralcomposites.com.